Huge Savings Item! 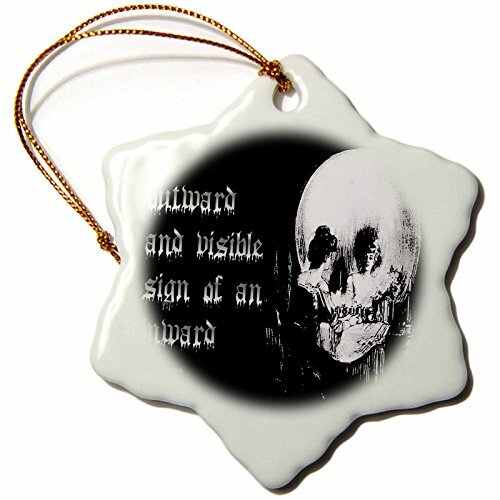 Save 14% on the 3dRose All Is Vanity Ghost, Halloween, Optical Illusion, Paranormal, Seasonal, Silhouette, Skeleton Snowflake Ornament, 3'' by 3dRose at UtopyaCon. MPN: orn_47079_1. Hurry! Limited time offer. Offer valid only while supplies last. 3dRose snowflake ornament - this glossy porcelain ornament is a great gift for family and friends, commemorating each holiday or special occasion. 3dRose snowflake ornament - this glossy porcelain ornament is a great gift for family and friends, commemorating each holiday or special occasion. Image printed on both sides; measures 3". a strand of gold thread makes it easy to display this fantastic keepsake. Manufactured in United States.